Semantics – Drone or Unmanned Aerial Vehicle (UAV)? Well, technically A3 “drones” can be both, so maybe Unmanned Aerial System (UAS) would be most appropriate since it considers the totality of the vehicle and the ground based components. For the sake of this article though, I’m going to use the term “drone”, so feel free to throw your flaming pitchfork at me at each mention of the word. 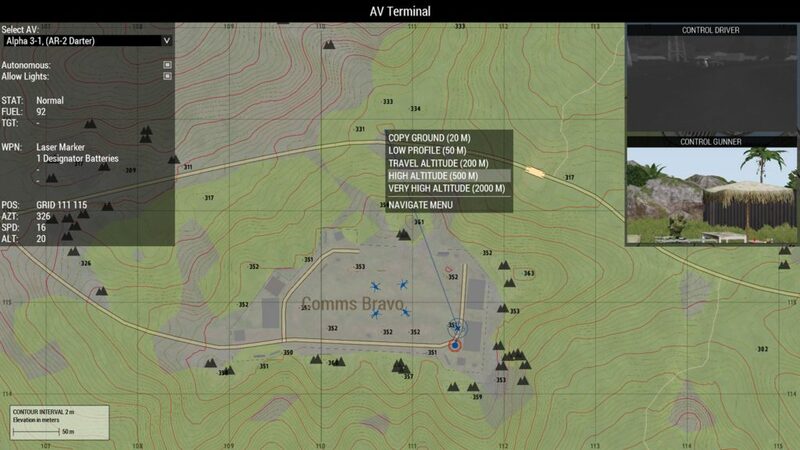 Preface – I’m not an Arma 3 expert. In fact, I don’t know a lot about A3 at all, but I have been known to be attracted to content that I find compelling. 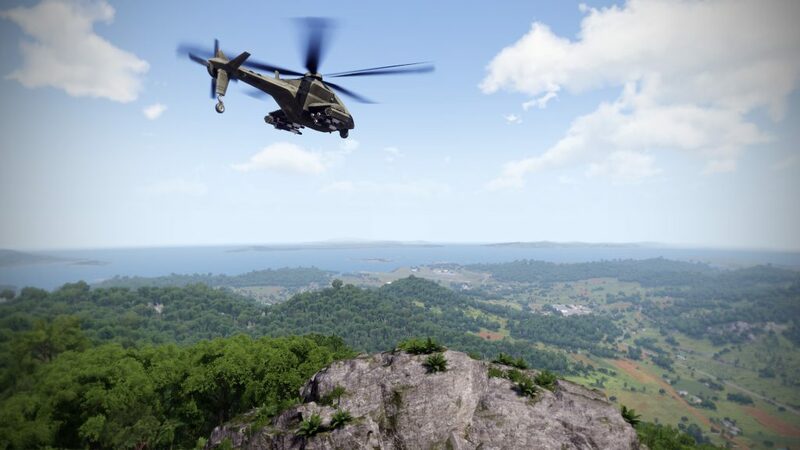 Whether it is helicopters, VTOLs, or solo missions with a good story, I’m down for some Arma fun when I need a break from more complex flight sims. I just figured I’d mention my lack of A3 knowledge because this article isn’t a tutorial and I’ll probably get some stuff wrong. 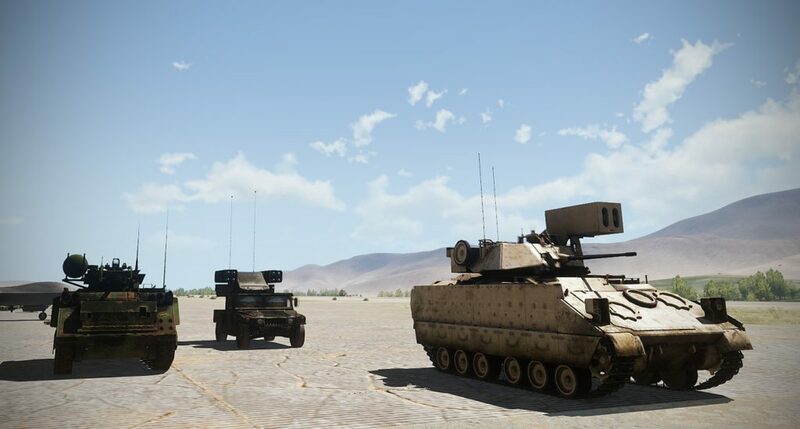 The beauty of the A3 sandbox is that pretty much everyone can find a toy to play with either in the stock missions or through add-on content. 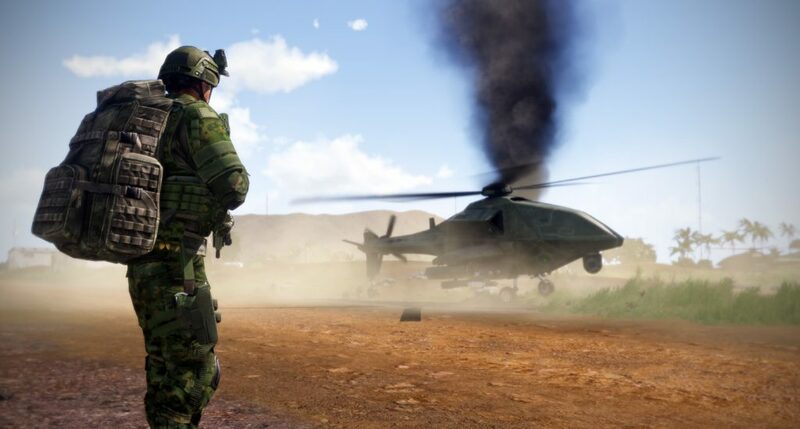 While the focus and specialty of A3 has always been infantry type combat, there is plenty of content and gameplay to be found for helo and fixed wing pilots, armor fans, and even civilian SAR type mods. I find that I really enjoy A3 for helo type missions because of the ultra-high level of detail of the terrains and the ability to occupy pretty much every vehicle in the inventory. 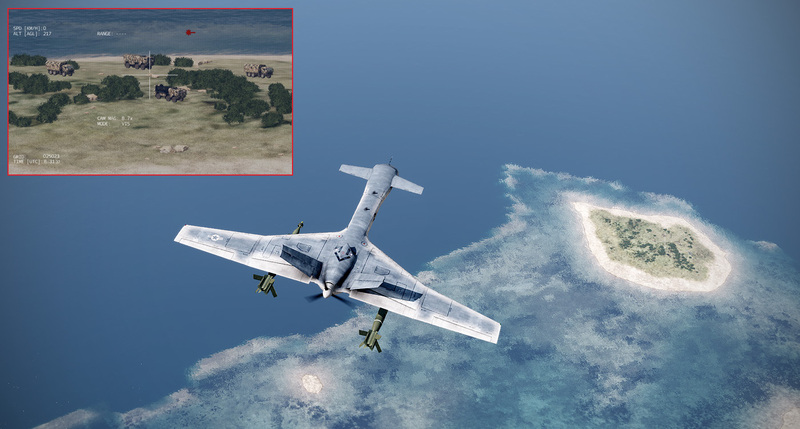 The relatively small size of A3 maps makes me reluctant to try out more exotic fast jets and attack aircraft simply because I feel the maps are more suited toward low and slow flying vehicles. 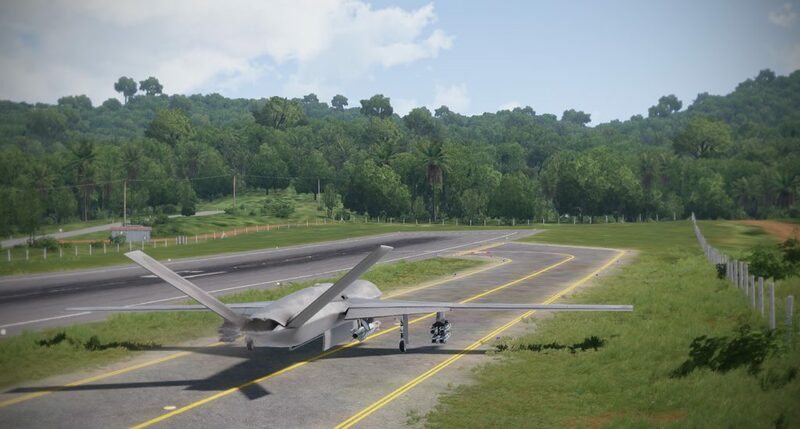 When Arma Apex released last year, I took quick notice of the new VTOLs, but only just recently came across the very fun MQ-12 Falcon UAV. Once I started dabbling in the UAVs, I found it hard to stop experimenting! And while the A3 drones are quirky and temperamental, they can offer an interesting perspective on the battlefield – literally! 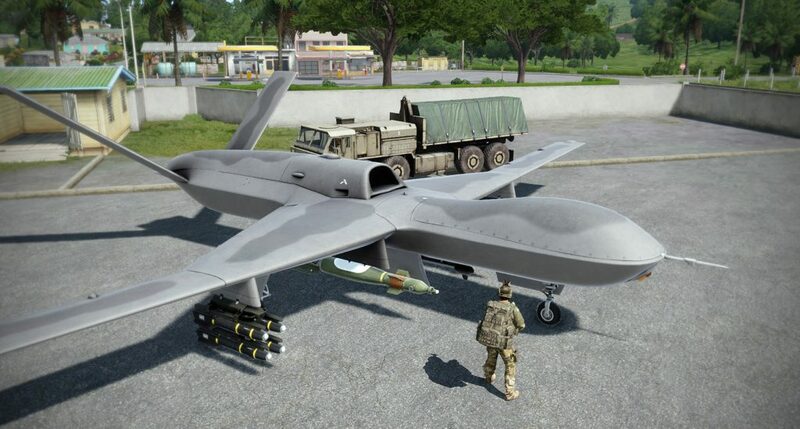 The Apex expansion added the MQ-12 Falcon UAV to the NATO arsenal. Equipped with six Scalpel A2G missiles, and a pair of rocket pods, the Falcon packs a punch nearly comparable to the most capable manned aircraft in A3. 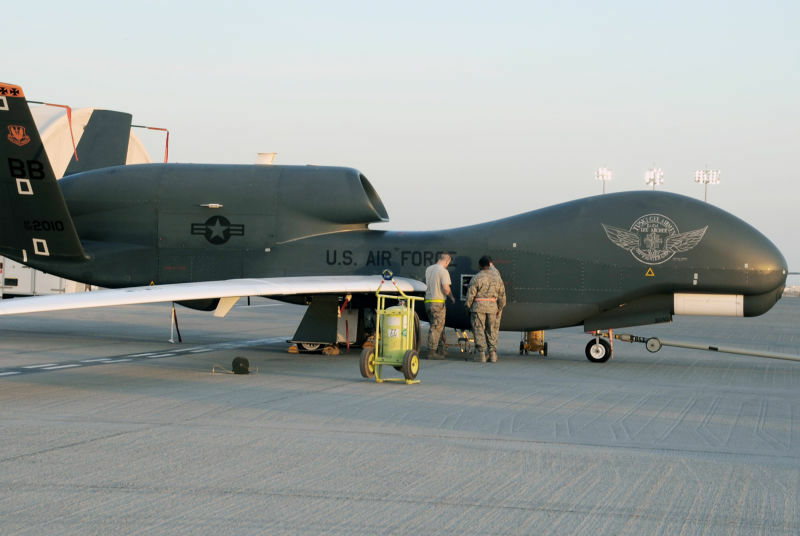 The lineup of drones in A3 encompass everything from user created nano-UAVs that provide individual soldiers a recon ability, to massive Predator and Global Hawk-like aircraft that can carry thousands of pounds of ordnance and fly at jet aircraft speeds. 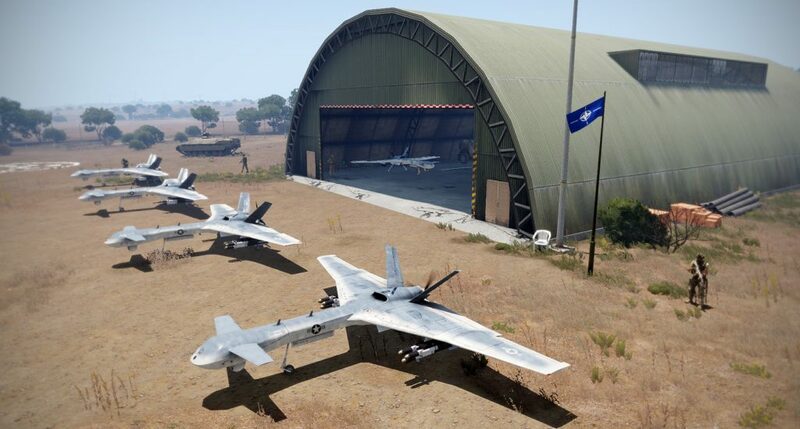 The official A3 lineup includes the backpack stowable AR-2 Darter/Tayran quad-copter, the Predator-like Yabhon R-3 / K40 Ababil-3 recon/attack drone, the KH-3A Fenghuang, the MQ-12 Falcon helicopter drone, and the KH-3A drone that conjures up visions of an armed Rutan Long-EZ. There are also ground vehicle drones, but our focus will be on the airborne assets. 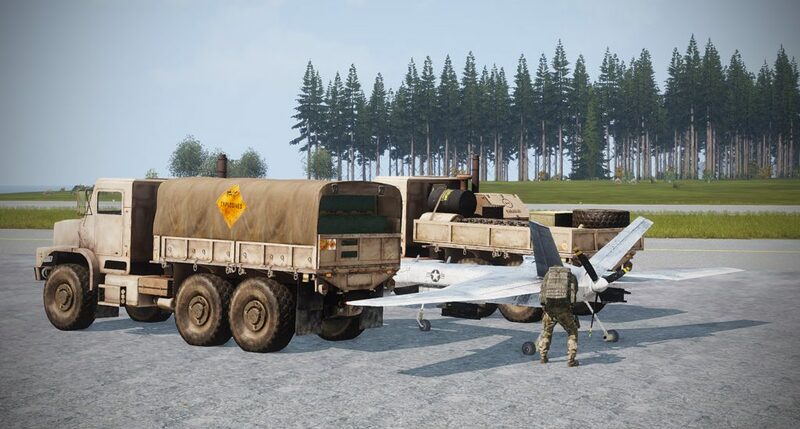 The user community have also added vehicles such as the RQ-11B Raven, the Pchela-1T, the APEX Drakon, the U.C.S.V Cargo and Support Drone, and the MQ-9 Reaper. 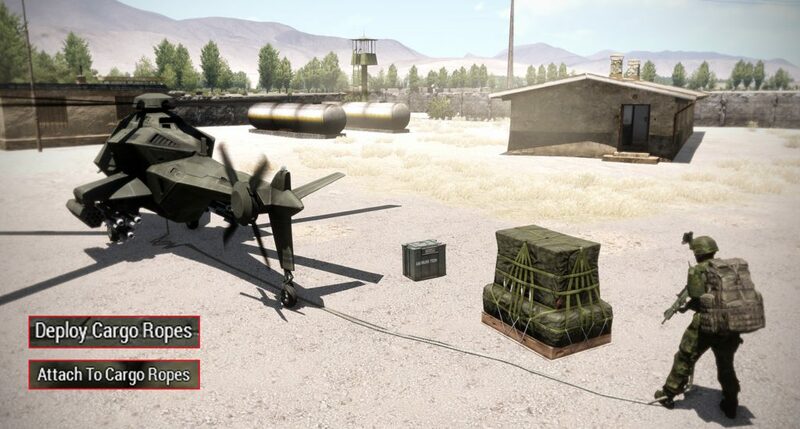 The AR-2 Darter quad-copter is an unarmed recon/designator drone. The Yabhon-R3 and MQ-9 Reaper. In order to use the drones, you have to have a UAV terminal in your possession and be on the faction that owns the drone. 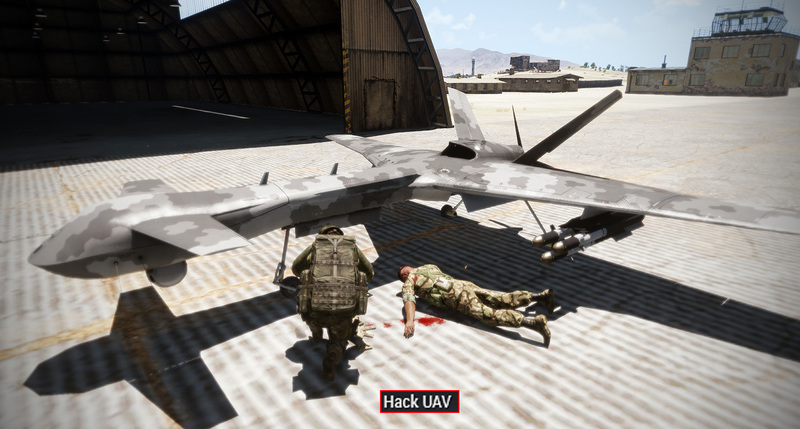 You can also approach an enemy drone and, if you are an actual Drone Operator specialist, hack it to gain control over the enemy drone. 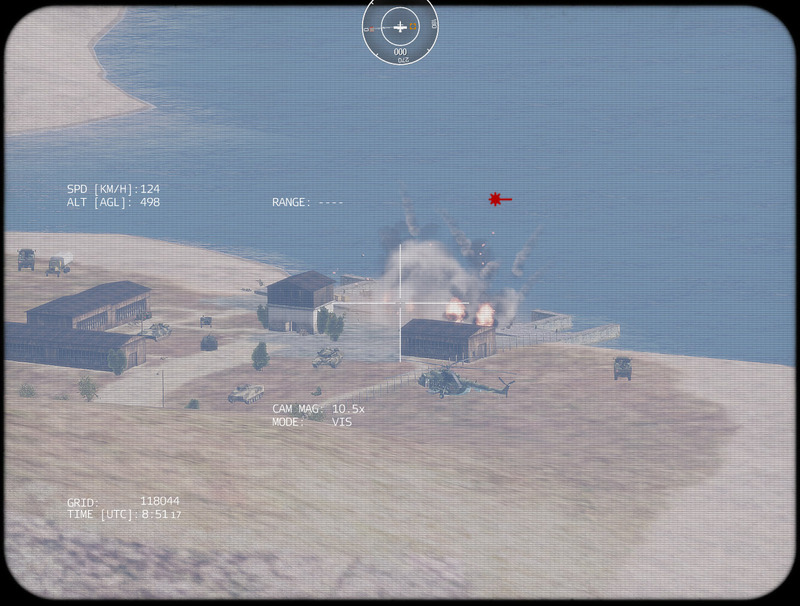 This can make for some fun and interesting “seize the drone” type missions. The often made observation, which is 100% correct, is that the drones in A3 are definitely…temperamental. I can often be heard shouting at my drones: “Good drone..good boy…goooood drone..wait..STOP! Bad drone, bad, bad, bad drone.” It is definitely a love/hate relationship. 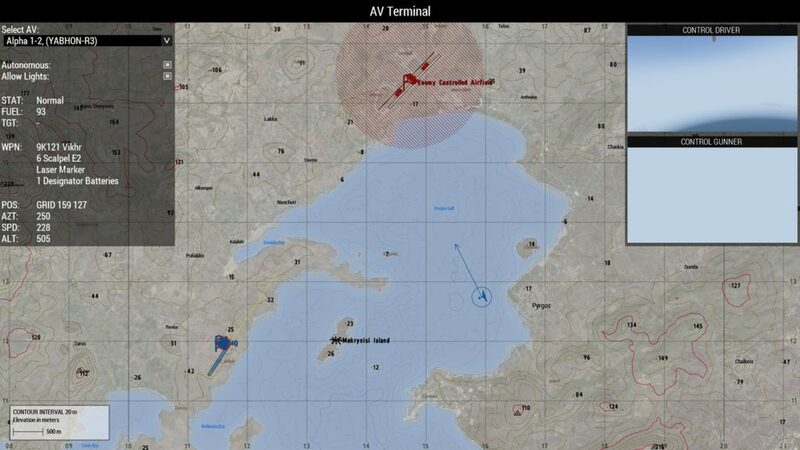 Most of the “bad” drone behavior that I’ve observed could be solved if Bohemia Interactive would allow us to set drone operating altitudes in mean-sea-level (MSL) altitudes. In my experience, the drones seem to get lost and wander mostly when they are trying to ascend or descend to an enroute altitude, and since you input an altitude for them to adhere to, they struggle to maintain an above-ground-level (AGL) altitude which can result in some wild gyrations. If you have the opportunity to park your drone over water, they seem to operate nice and smoothly. 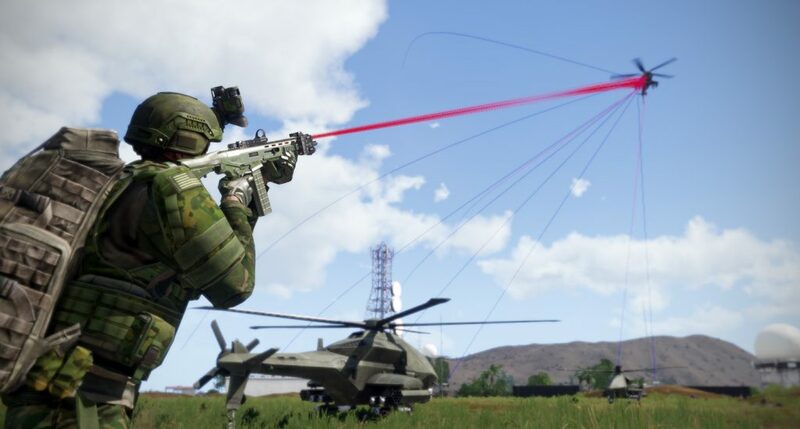 The gyrations make targeting and recon difficult, so it is understandable that people get frustrated and just dismiss the drones as a broken part of Arma. With a bit of practice (and I’m still learning), you can work with the pesky drones and learn their behaviors and anticipate just how much you’ll need to hold their hand. 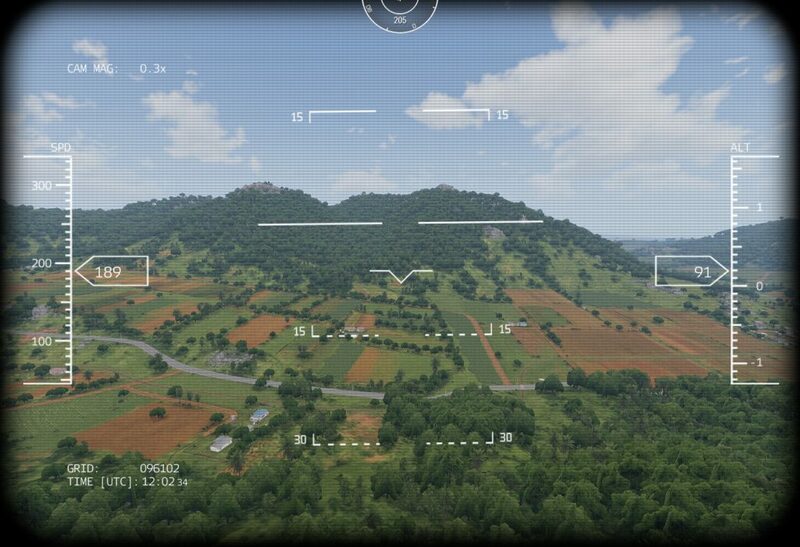 Operating the drone can be done manually (by taking direct control and flying it yourself, or assuming command of the targeting/recon pod) or by setting waypoints using the AV Terminal. You can operate multiple drones simultaneously from the AV Terminal, which can become quite a juggling act if you have particularly free-spirited drones. 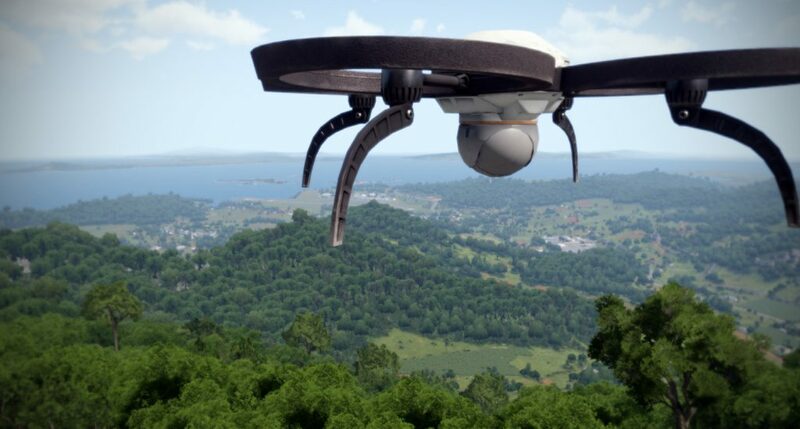 Typically, you’ll want to find a nice, safe place from which to operate your drones, because you really can’t run and gun while managing the Mudspike Drone Force. 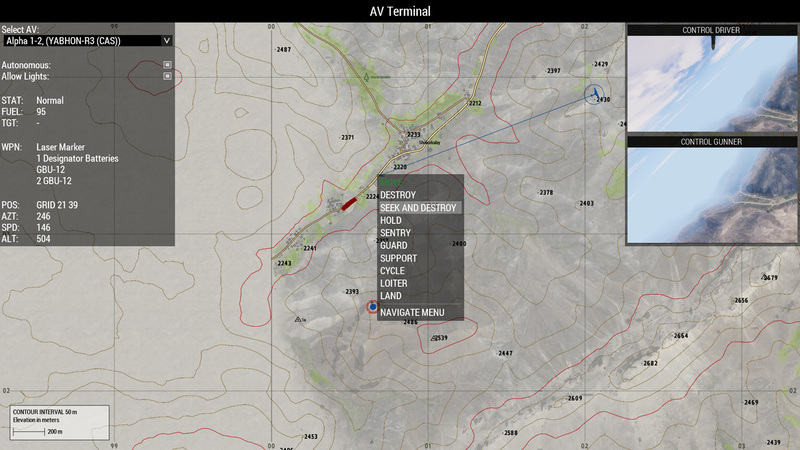 From the AV Terminal you can plot waypoints for the drone to follow, and refine the drone behavior with regards to travel altitude, rules of engagement, and what type of action to perform upon reaching a waypoint. 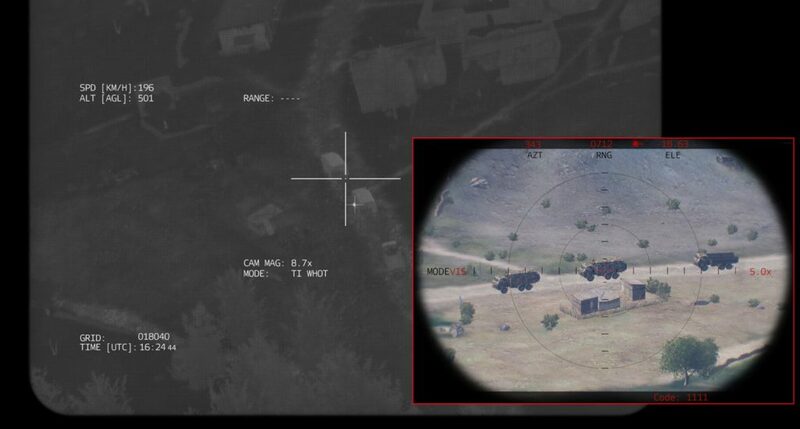 You can, for instance, plot a path toward a target, allow the drone to autonomously engage targets at will, or provide more strict rules that allow you to pick targets individually, or engage targets manually. The variety and uses for the drones really are endless provided the mission is appropriate to their use. The AV Terminal, from which you will attempt to herd your cats…er…drones. Drone operating technique also has a lot to do with whether you’d be noticed or not. Fast relative motion is easier to spot than a slow moving or steady drone while terrain masking and altitude also contribute to stealthiness. 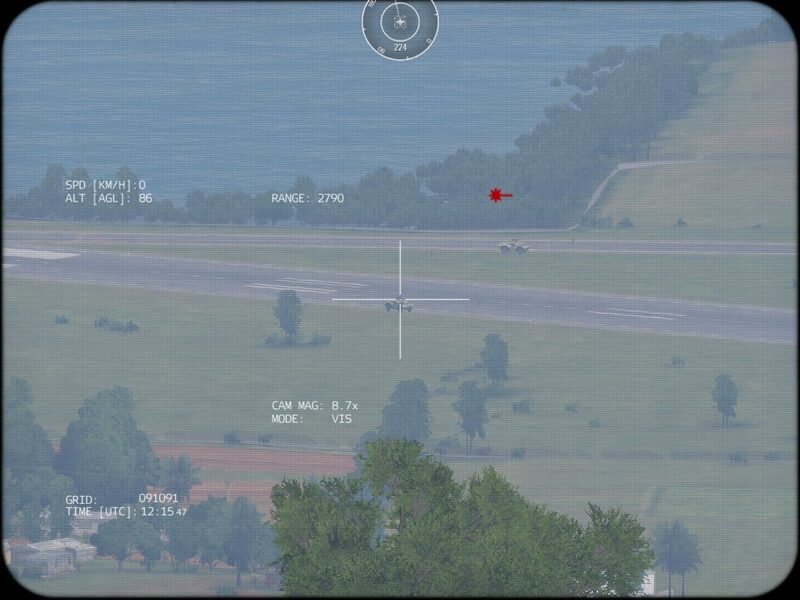 Out of curiosity, I loaded up the small AR-2 Darter and flew it around my compound and used its laser rangefinder to determine the range at both which I could hear it and see it. 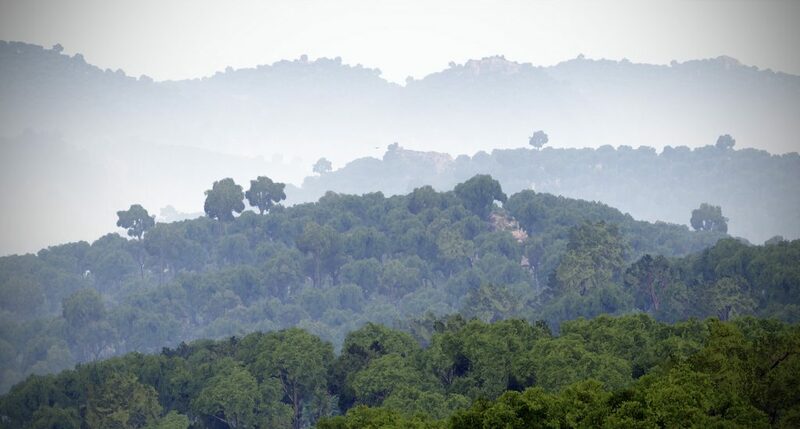 To my surprise, at a distance of just 270 meters (horizontally) and 200 meters altitude, there was no discernible sound (at least in my house – a headphone user might not find that to be true). Creeping in from there, I was able to spot the drone at just inside 270 meters and the first faint buzz showed up at 200 meters. That is not a long distance by any means! And that was with me having the advantage of both knowing a drone was there, and knowing what direction to look for it. 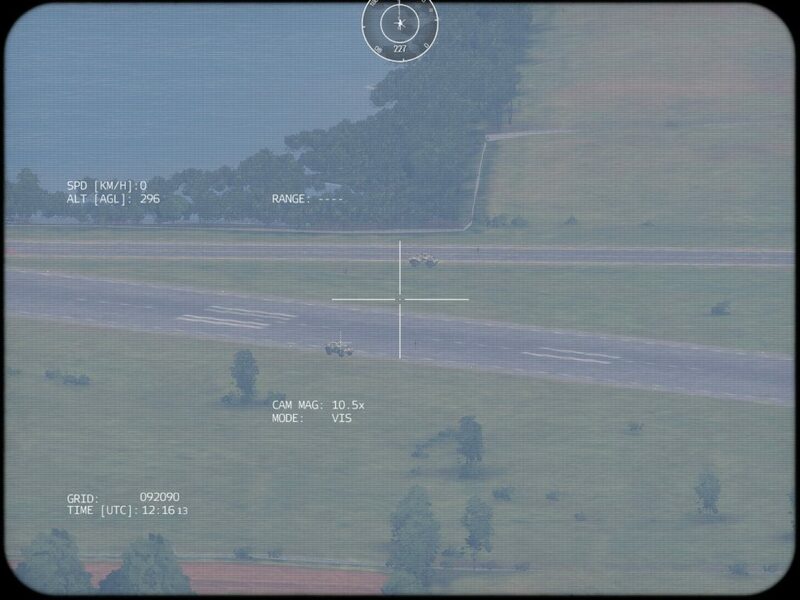 With multiple levels of zoom (.5x, 2.5x, and 8.7x on the Darter) and daylight TV and IR cameras, the Darter could easily spot me, and at the highest zoom level could probably read my rank without me even knowing he was there. Can you spot the Darter? How about now? – Too late, a laser-guided bomb is already click-clacking its way down the pipe at you! 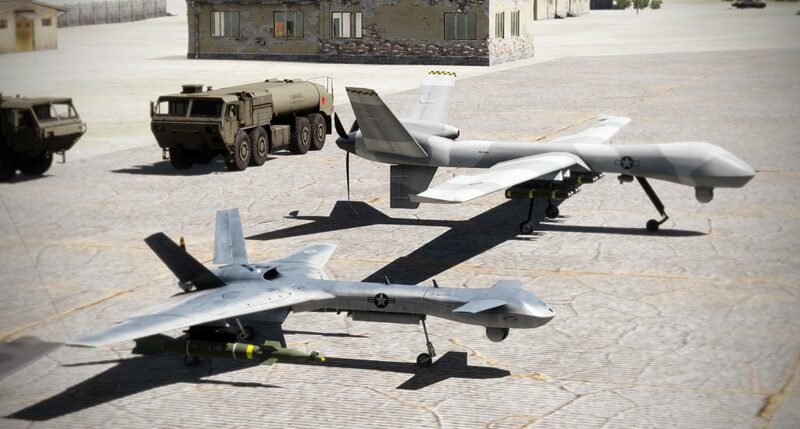 A similar test with the MQ-12 Falcon, which is not a small UAV at all, but rather more a full size helicopter, came out with not-surprising results compared to the Darter. At 2,000 meters I could not see or hear the MQ-12, at a bit under 2,000 meters I could start to hear the helo, and at 1,500 meters I could see the dot of the helo (again, knowing where to look). MQ-12 Falcon visible at 1500 meters. 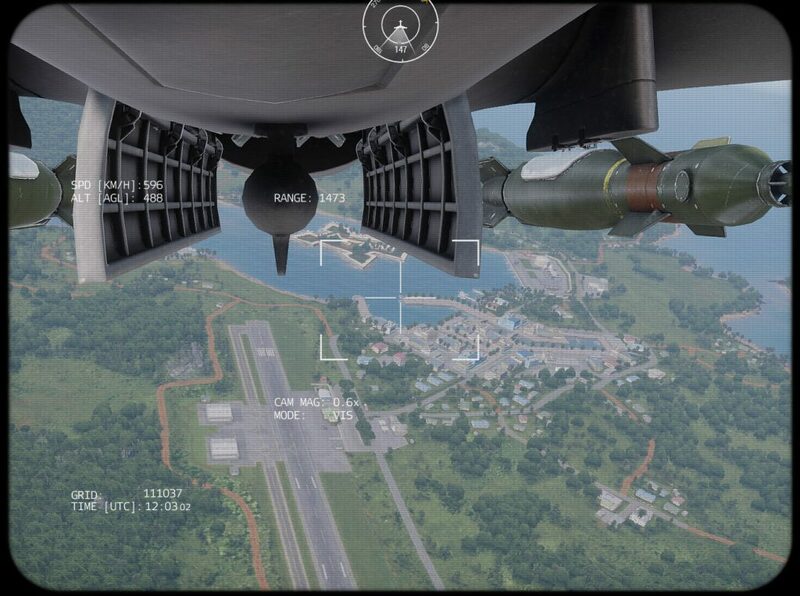 The view from the MQ-12 Falcon at 1500 meters. A comparison of the available zoom levels typical of most of the drones. 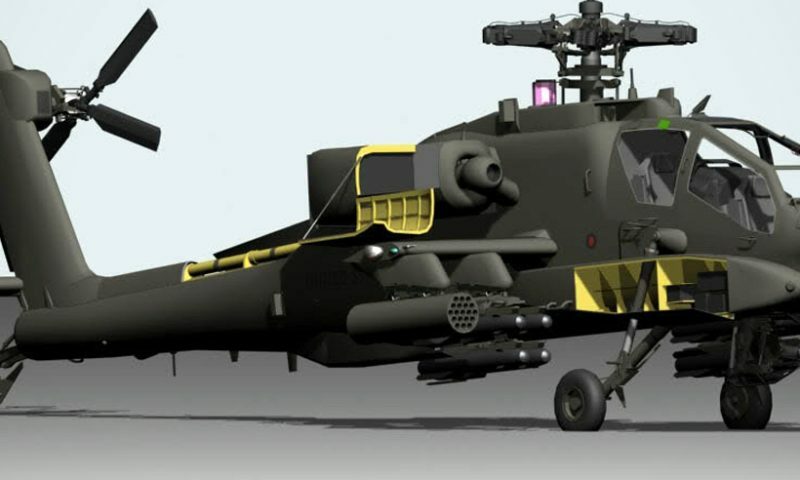 ..and can be deployed to scout and lase targets. Autonomous or “auto no mas”…? As previously mentioned, the drone logic can be a bit…err..mysterious at times. 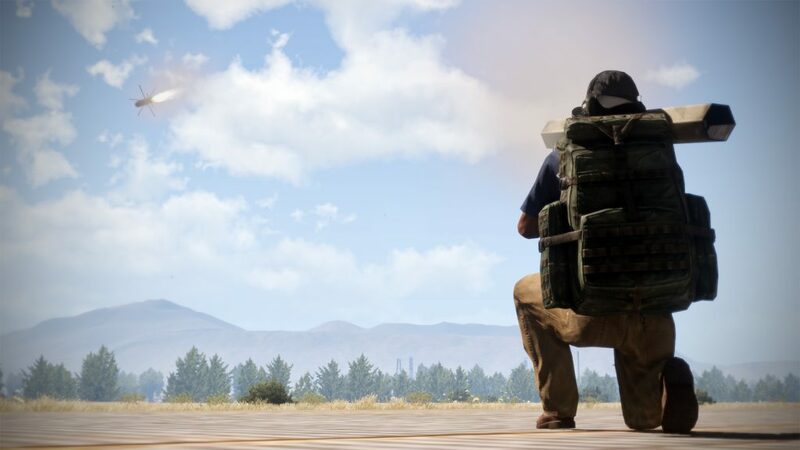 When all else fails, sometimes you just have to tell your teammates to cover you while you sit down on a bench and give the UAV your full and undivided attention. Assuming direct control of the UAV will almost always result in a better outcome when you are trying to get to an exact spot for a specific reason. Once the drone is in a stable holding pattern where you want it, things generally improve. Each of the drones flies a bit differently in manual mode. 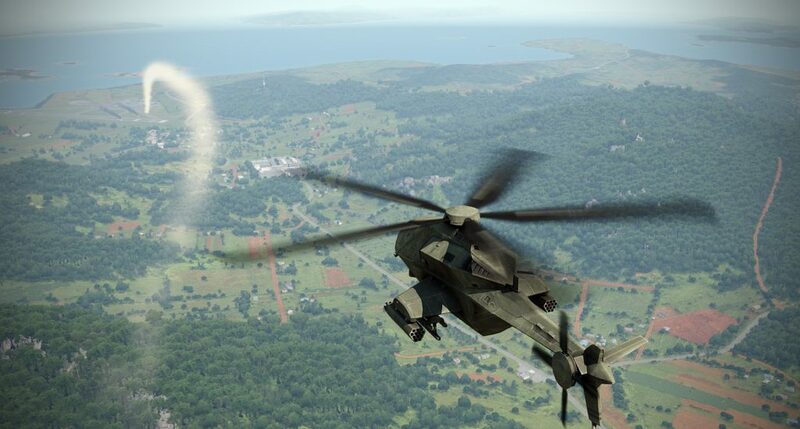 The AR-2 Darter is nimble and frighteningly responsive, which can lead to overcontrolling the drone initially. The Yabhon and Reaper fly like traditional fixed wing aircraft, but they definitely climb at a much greater rate when they have some speed on them. Fixed wing flight dynamics have never been super-high on the A3 realism bullet points, so while they are passable, they aren’t ultra complex. 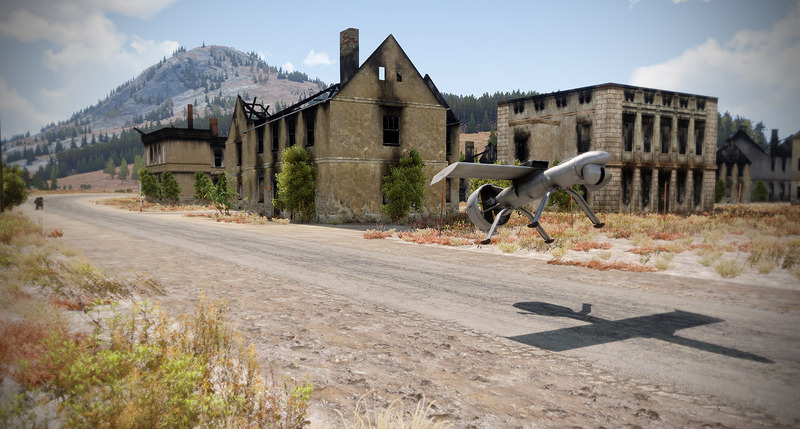 The aspect that initially drew me into exploring the drones further was the recently inclusion of the MQ-12 Falcon helicopter drone, which is fantastic fun to fly. I would guess it borrows from the rotorlib flight dynamics that are definitely more robust than the fixed wing modeling. 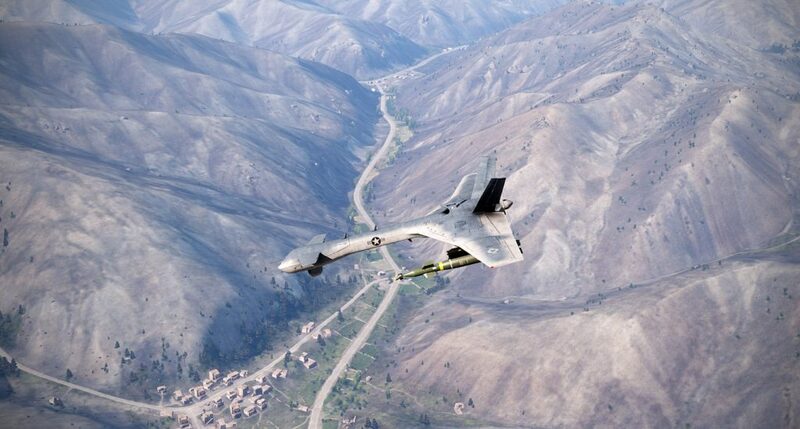 Even though it is a drone, the MQ-12 flies very much like a “little bird” helo and is enjoyable to fly manually. 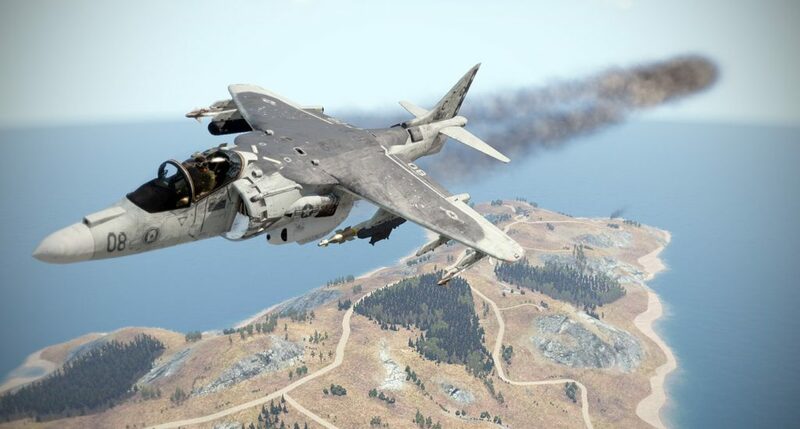 The normal helo flight controls apply (all you misguided souls that are pushing for power/collective can still map it that way on your HOTAS) and autohover still works when you need a break. 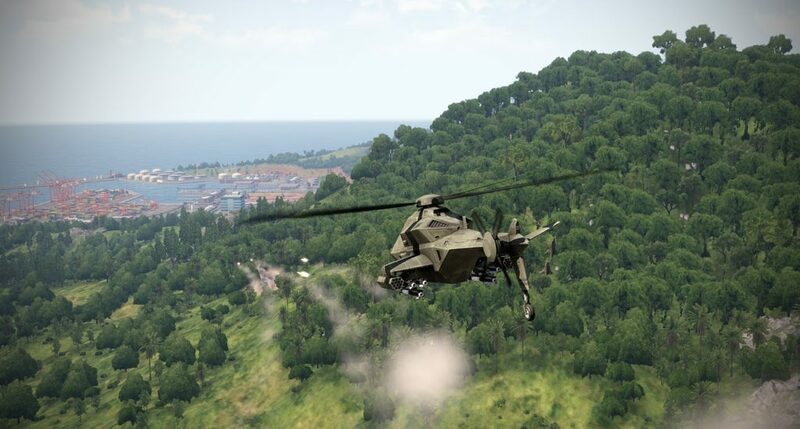 The biggest difference from the other A3 helos is that your pilot position has a constrained view since you are flying it remotely with a fixed forward view. Don’t forget to hit the numpad minus (-) key to fully zoom out the view when flying manually, which will give you more field of view. You can also incrementally zoom in further if you prefer, but flying while peering through the “soda straw” can be a bit more challenging. A comparison of the three different field of view settings that are available when manually flying the MQ-12 Falcon. 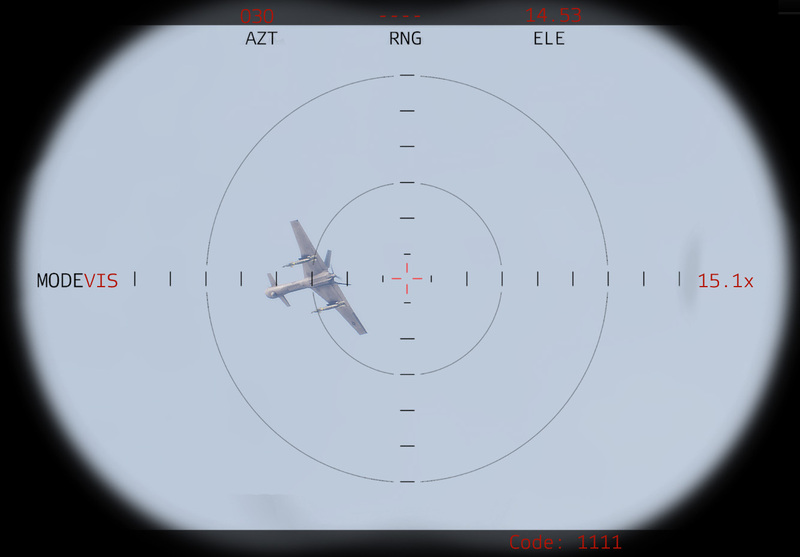 Generally, the wider field of view gives a bit better situational awareness. Another really cool feature of the MQ-12 Falcon drone is its ability to sling-load supplies and equipment for delivery to the battlefield. 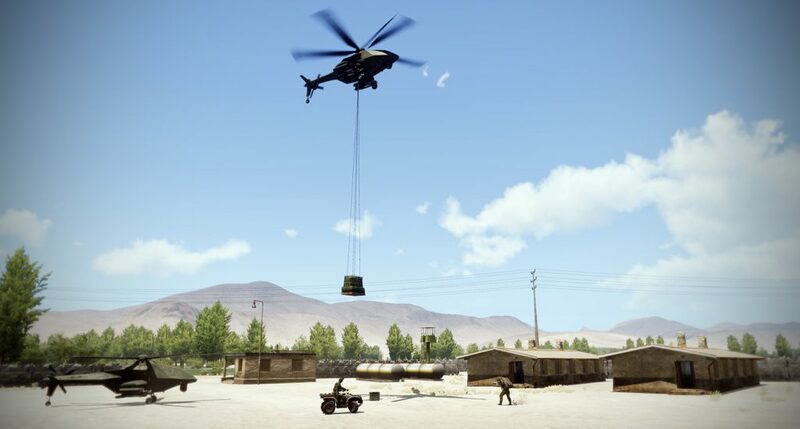 I could not find a way to automatically pick up and release loads, rather you must walk up to the drone, select “DEPLOY CARGO ROPES” then pick up and attach the ropes to the sling load. Once the cargo is attached, take control of the drone and manually fly it to lift the cargo and place it where you want. I did not see a feature to “auto unhook” the cargo, so I was simply using another troop at the receiving end to disconnect the cargo and stow the ropes. 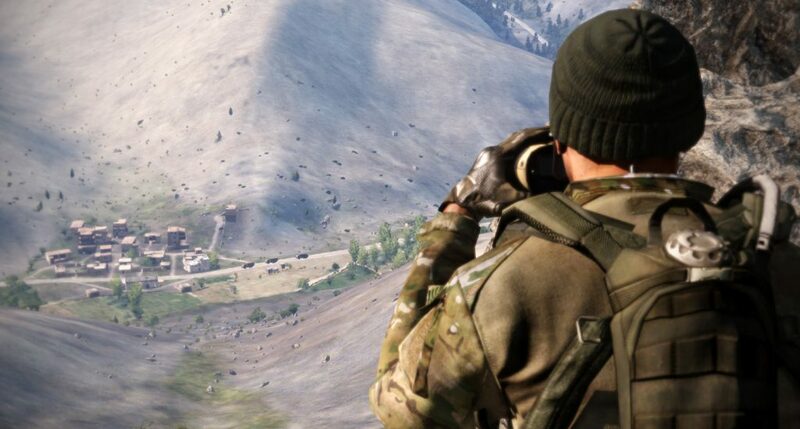 It is a really cool feature that can add a lot of interesting possibilities to missions, and spur a lot of conversations about who is going to go out under enemy fire to detach the ropes. 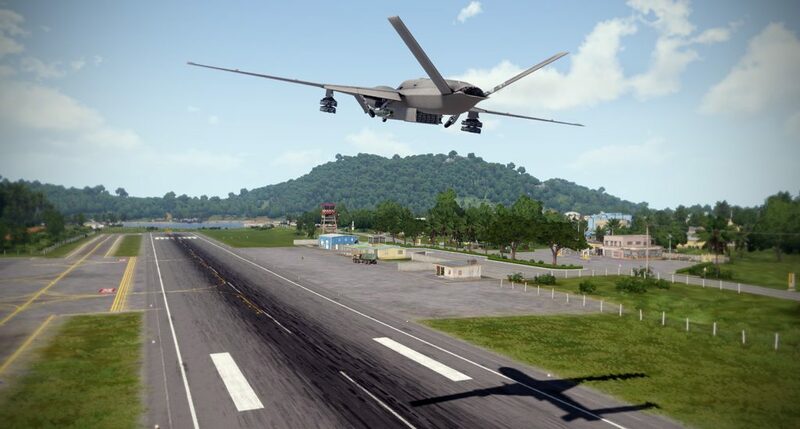 It is also worth mentioning that the vertical takeoff drones (the MQ-12 Falcon and the AR-2 Darter) have the distinct advantage of being able to hover in place once you get them into position. 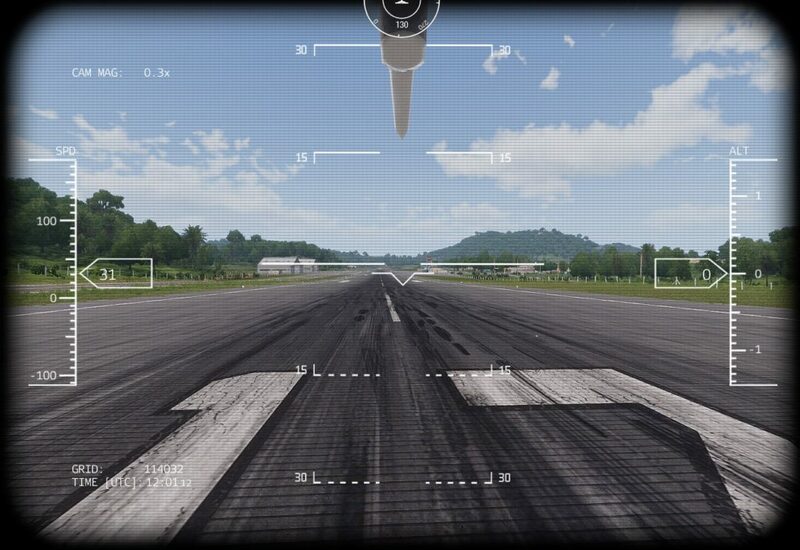 The stable platform allows for gyration-free viewing from the sensors without all of the twisting and turning of the optics gimble ball that you get when dealing with an orbiting fixed wing platform. 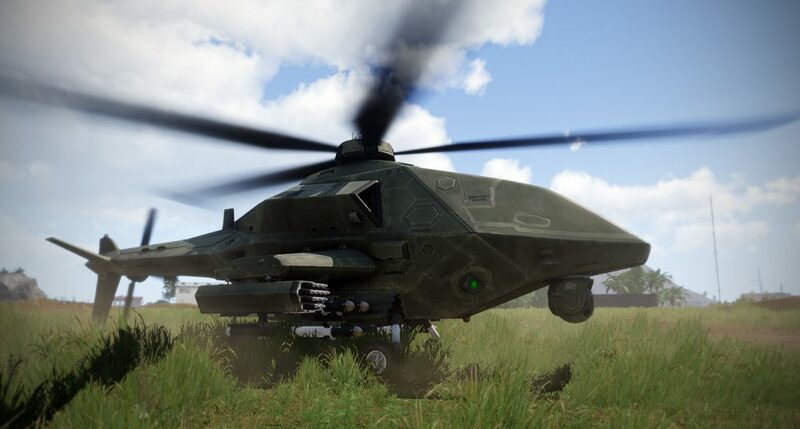 You can still make the vertical takeoff drones fly orbits if you prefer, but they are well suited to low altitude, pop up viewing and targeting opportunities much like a manned attack helo is. 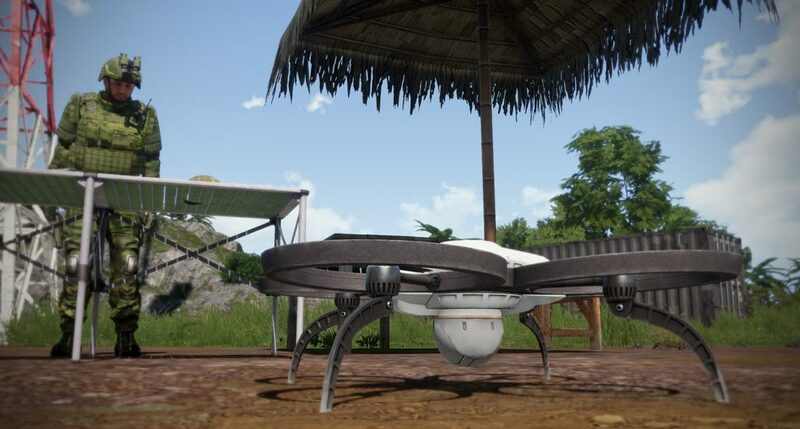 Depending on the mission design, the drone can be used in a pure reconnaissance role, support of weapons employment, or direct attacks that are primary to the mission objectives. 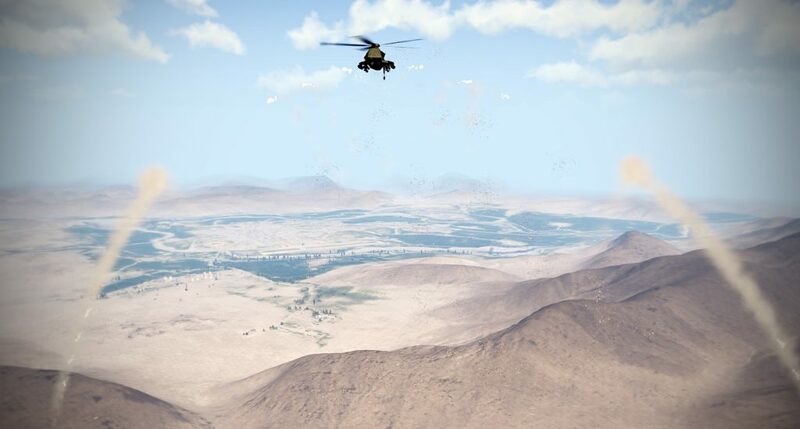 The first is a relatively simple concept – a drone circling high above the battlefield has a unique vantage point with an extensive viewing range that can minimize obstructions due to terrain or buildings. As well, the high magnification sensors allow for close scrutiny of areas allowing the viewing audience a better appreciation for both the type and disposition of the forces you are facing. Daylight TV optics and IR sensors make it easier to study details or pick out hot spots among background radiation. That said, the sensors cannot see through clouds and fog, so they are of limited value in poor weather. ..and the same view at 10.5x zoom. Smile! While the unarmed drones are perfect for recon and directing attacks, the more toothy variety carry a variety of weapons to get the job done. 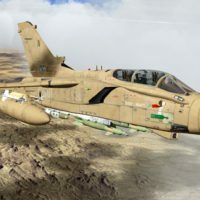 Typically you’ll find drones carrying air-to-ground guided missiles such as the Scalpel or Hellfire, while laser guided bombs such as the GBU-12 or GBU-24 provide for maximum shock and awe. You do have to apply a bit of suspension of disbelief with regards to the loadouts because some of the wing planforms and engines don’t really look like they could support 4,000 lbs. or more worth of ordnance and fuel, but who cares? Some platforms can also carry unguided rockets in pods, which will definitely require you to manually fly the drone onto the target. 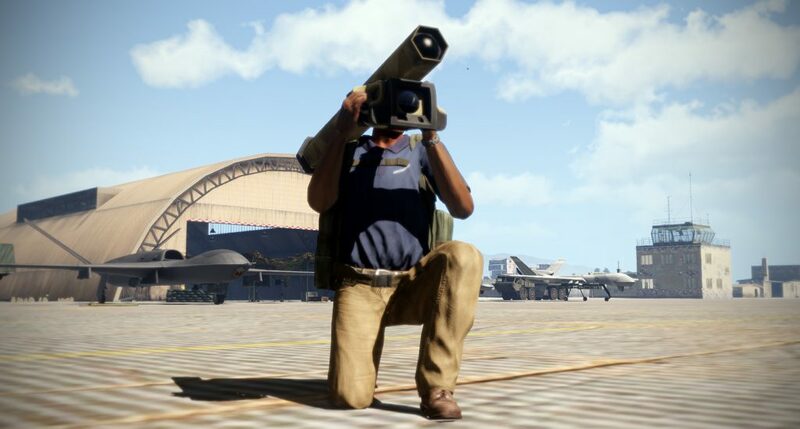 Enterprising modders have also added a cannon to some drones to give the approximation of a mini AC-130 for fire support. 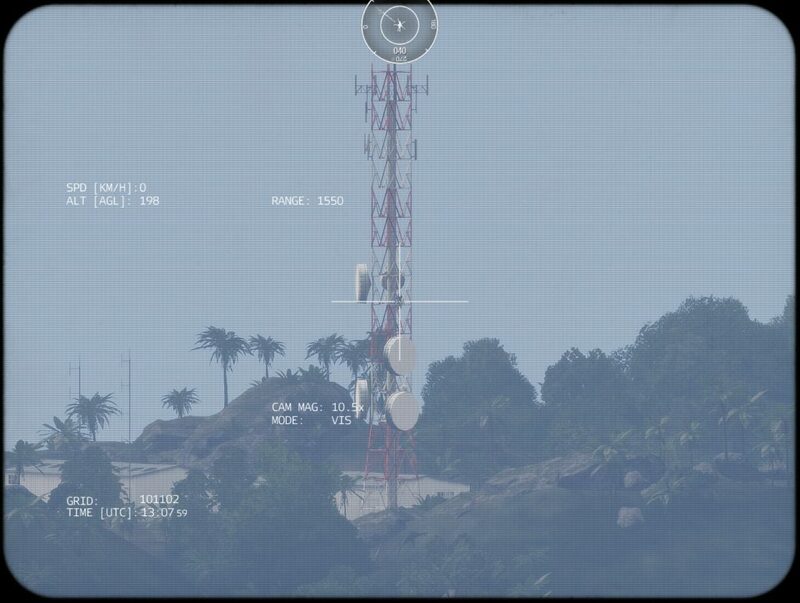 If you can get the platform stable enough, the weapons/optics station has a great targeting capability by either ground stabilizing the camera on the target, locking the target, or using the crosshairs as a moving optical sight similar to the way you’d continuously aim a TOW missile. It’s not all fine and perfect though, which is nice, because missile can and do miss – so there is a nice feeling of uncertainty with each strike. 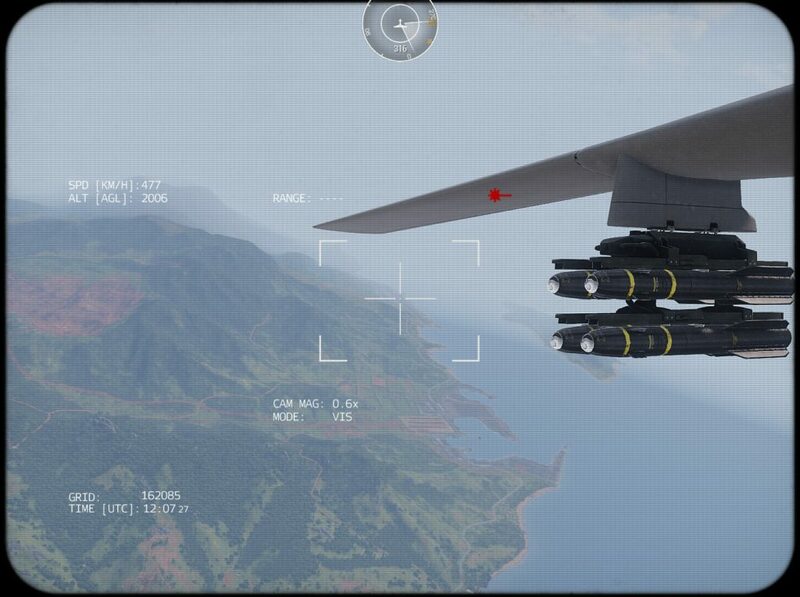 I found the MQ-12 Falcon is able to target and attack using guided missiles from around 3,700 meters – much beyond that my missiles would struggle to lock on, and at some distances level of detail (LOD) factors come into play despite my having the draw distance maxed out. 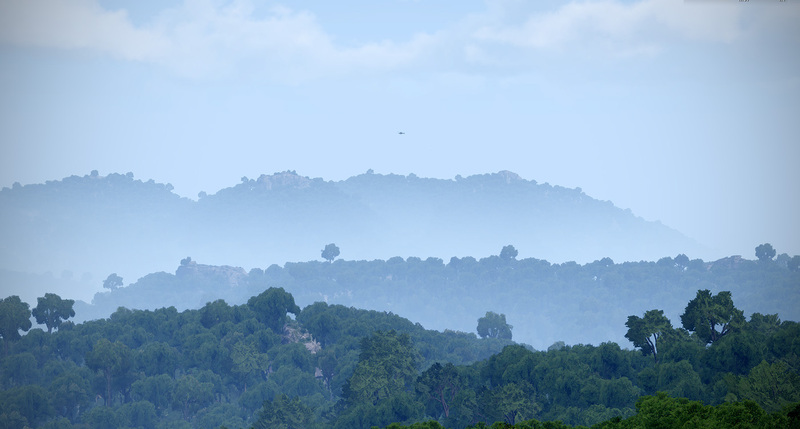 It would be nice to be able to extend the LOD distance a few more kilometers (perhaps there is a mod that does this). Of course, the most fun for a button pushing geek like myself is the more complex weapons capabilities that both the armed and unarmed drones are capable of. Most (if not all) of the drones contain optics that also feature a laser rangefinder and laser designator. 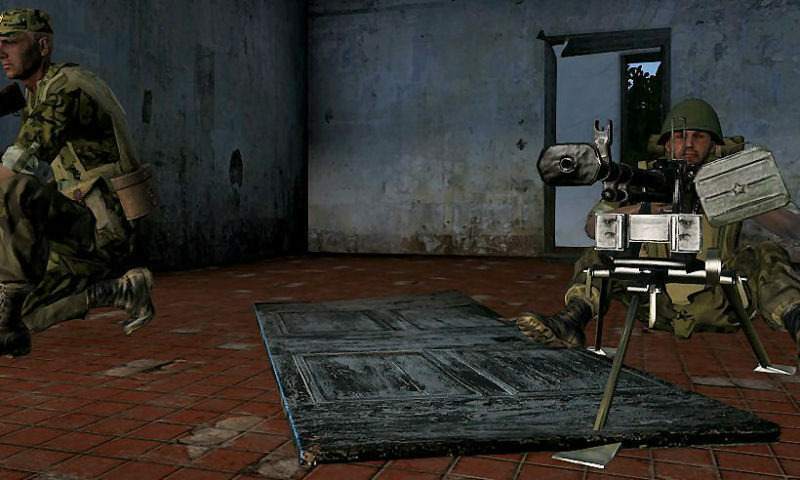 Thus, you can scout and locate the enemy from afar, then let some other entity do the dirty work for you. This can be in the form of a human or AI fixed wing aircraft dropping a laser guided bomb, a human or AI drone firing a missile or dropping a bomb, or a ground based vehicle or soldier firing a laser guided weapon. (Or, you can be a FAC and adjust dumb weapons onto the target.) 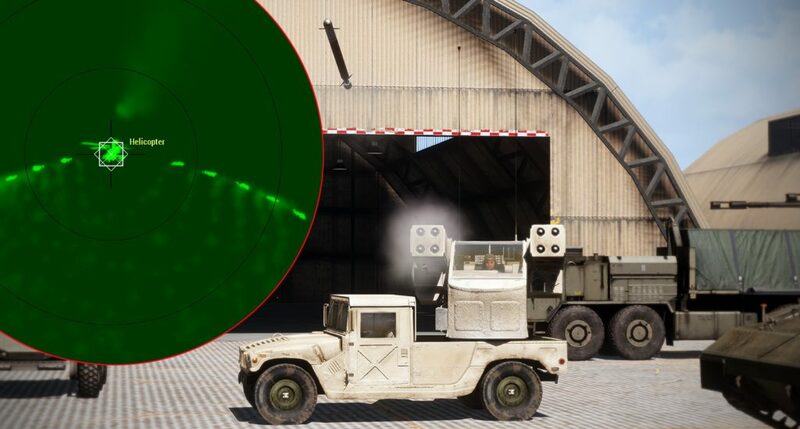 Since your laser designation also shows up on other player’s optics, they can readily see the perforated crosshair that is the object you are pointing at. This is useful for getting eyes on a target or for the actual conduct of the attack. ..while another MQ-12 looks on (note the perforated cross showing the other MQ-12 laser designation). Two laser designation returns simultaneously. I can’t tell you how endlessly satisfying it is to set up a nice designation and have other players or AI come in and attack your point. The teamwork and coordination is fun and while some might frown at us playing with our high tech toys overhead while they do the grunt work of seizing the objective with rifles in hand, hey – I know what a bad rifleman I am, so there’s strength in knowing your weakness. ..with exceptional speed and load carrying. Unfortunately the APEX Drakon project has been withering on the vine. 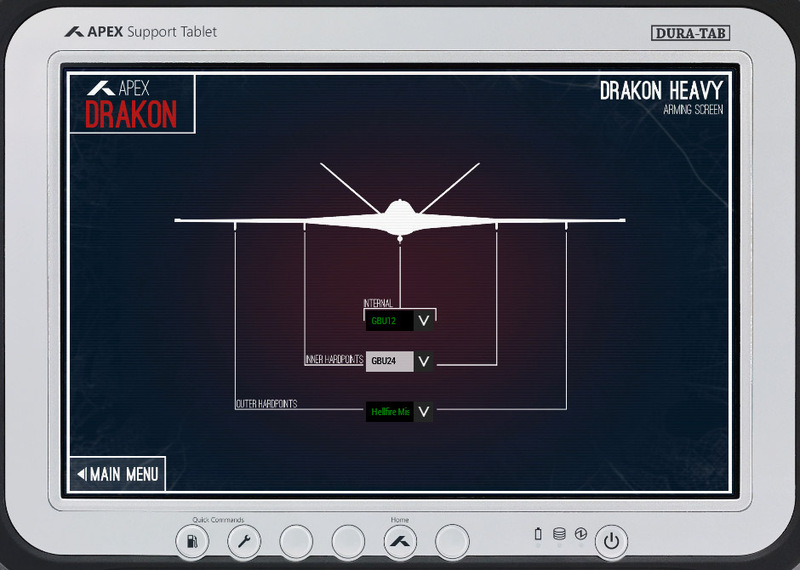 With some ACE incompatibilities, and a few bugs, the Drakon is a UAV with great potential..although I found it a bit too fast for the compressed battlefields that Arma features. Of course, the enemy is never going to be content to let you just sit up there in an uncontested orbit – raining death and destruction down on their side of the battle area. In the war against drones, other aicraft, anti-aircraft vehicles, and even other drones might be sent your way to exact their revenge. Even an infantryman with a gun can score a kill on a drone – some require only a shot or two, while others may require a couple full magazines to damage sufficiently. This is most definitely not my area of expertise when it comes to A3 because I can hardly name all the units (fictional or otherwise) that populate the Arma theaters. I do know there are radar guided and IR missiles that will smack down a UAV in a heartbeat, despite countermeasures being available. 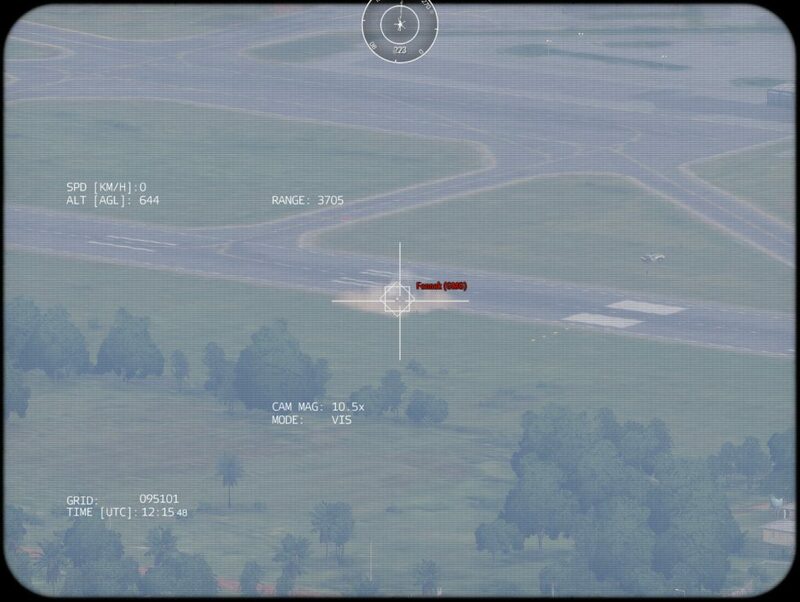 The 2,000 meter autonomous altitude setting does not seem to be high enough to avoid instant death if you wander too close to a capable surface to air missile vehicle. In doing a bunch of testing, I found that the infantry shouldered Titan MPRL was able to lock on at a maximum range of 3,800 meters – a range at which LOD makes it tough for the drone to return fire. Spoofing with flares seems to work pretty good in A3 though, giving you a fair chance of escape if you are quick to react. 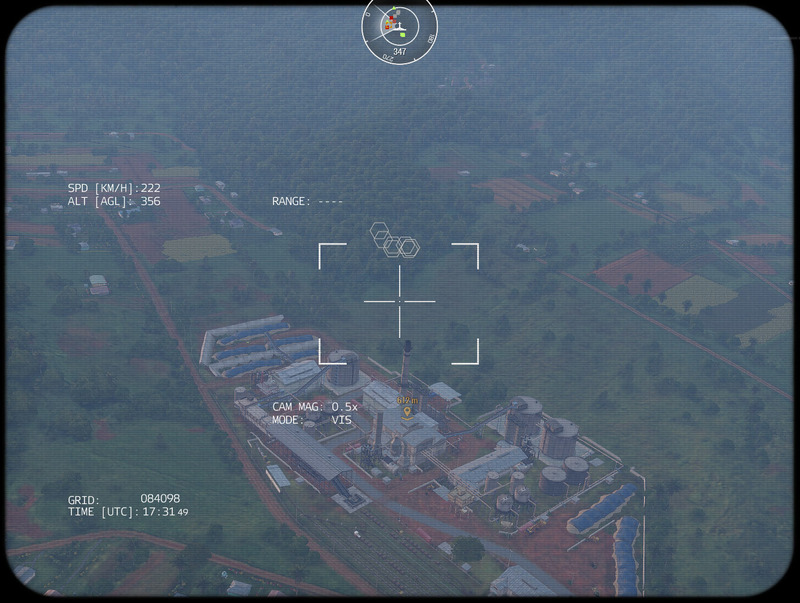 Hexagon symbols denote your friendly squad in this mission with drone support. 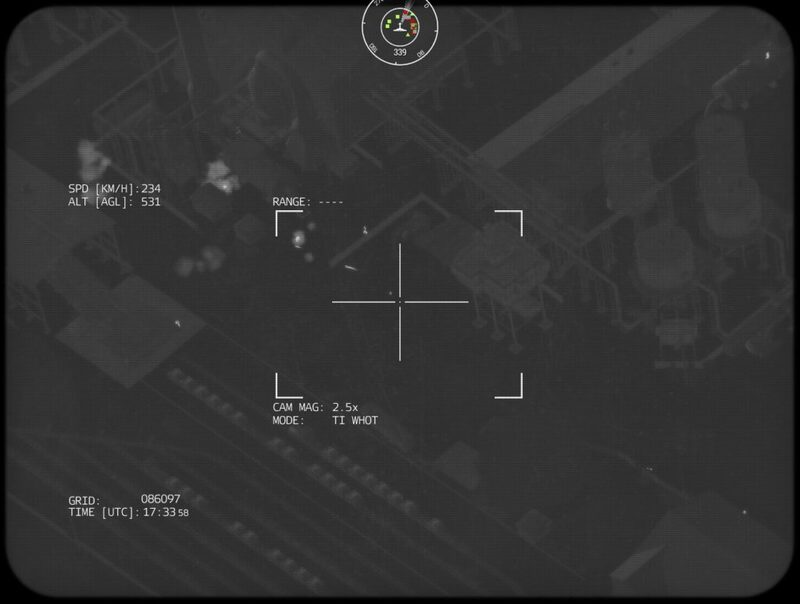 IR image of an attack using an onboard gun system. 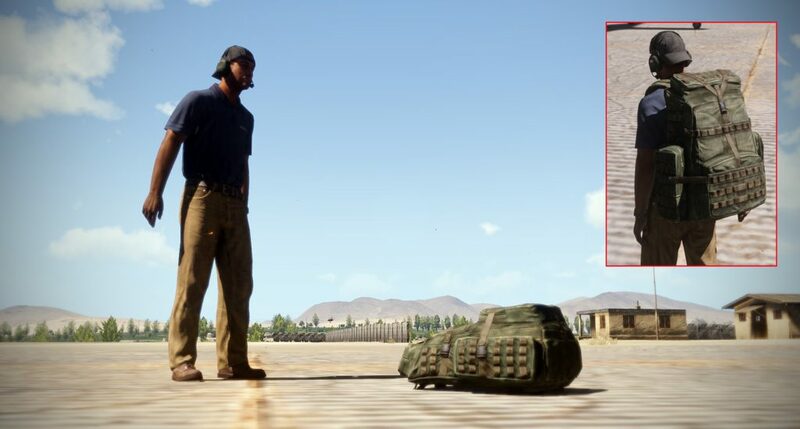 When lasing for attacks you have to be aware of surrounding objects that could interfere with the weapon delivery path. 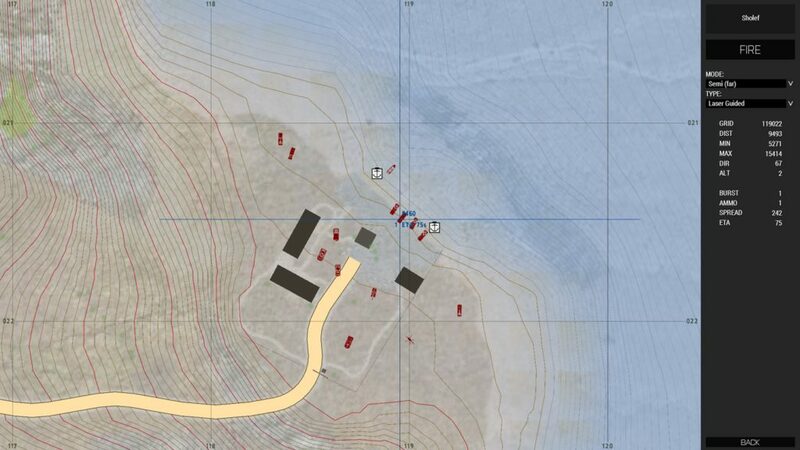 If the target area is not clear of anti-aircraft weapons, loitering in an area which only brings you the periphery of the enemy weapons range is a good idea. Using a pair of drones in concert is a great way to efficiently bring ordnance onto the target. 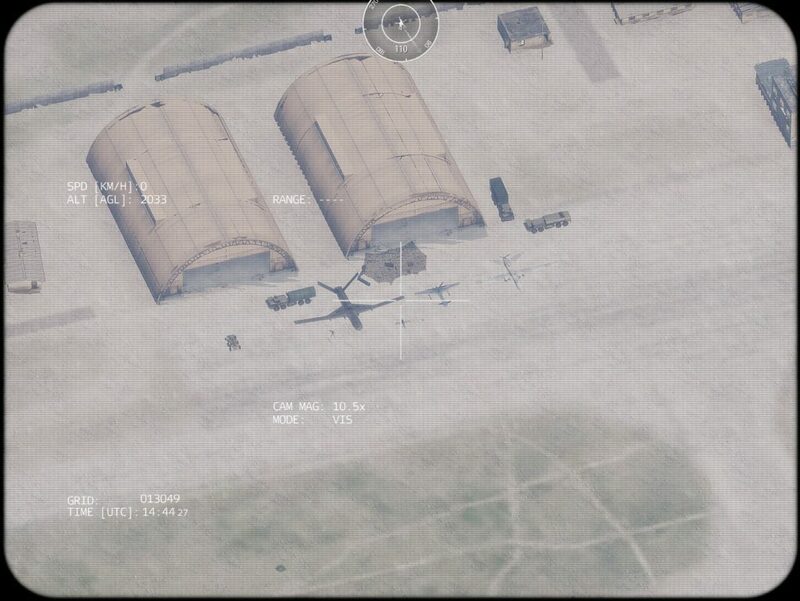 One drone can orbit safely away from the action, awaiting orders to attack, while the second drone pinpoints the target area and designates for the attacking drone. This minimizes time over the target area and ensures good recon prior to commencing the attack run. 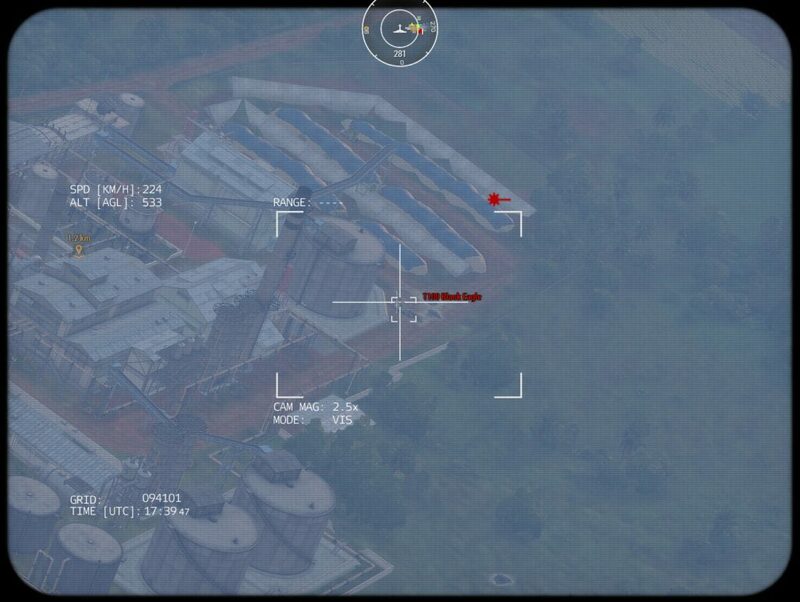 Using MANUAL FIRE mode and direct control of the UAV to attack a target being lased by a second drone. 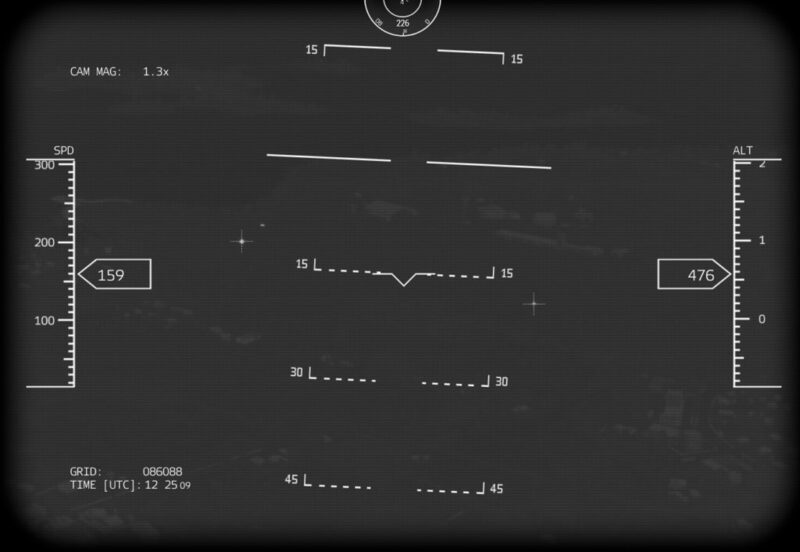 If you are going to have armed UAVs, fixed wing aircraft, or helos above you when executing an infantry attack – it pays to bring along some laser designators for targets of opportunity or to ease your path in and/or out. Again, using the designator in conjunction with a drone that has been given the SEEK AND DESTROY command is awesome fun. Find your target, fire the laser at it, and just wait for the UAV to come in like an angel of death. 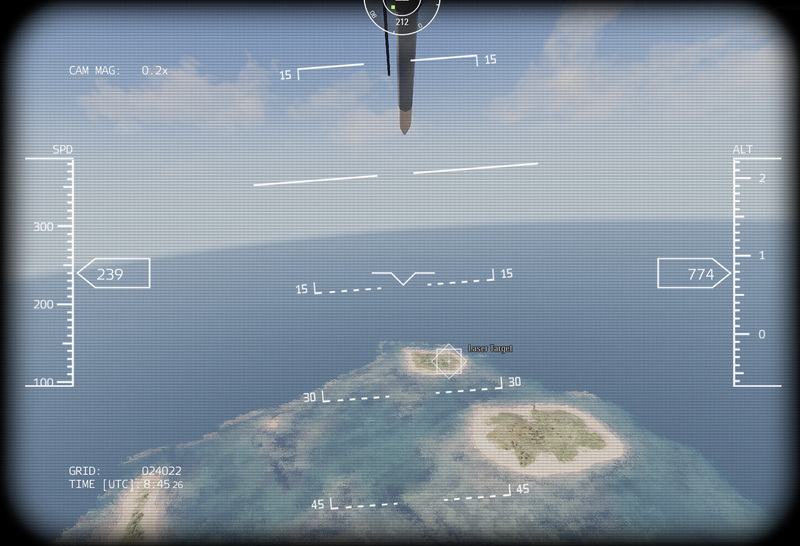 Of course, you can also use human or AI flown fixed wing aircraft as well, but regardless of the type it is good form to make sure the target area is clear of anti-air threats prior to bringing in air support. At the very least, make sure they are aware of anti-aircraft threats and target those high threat vehicles or personnel first. 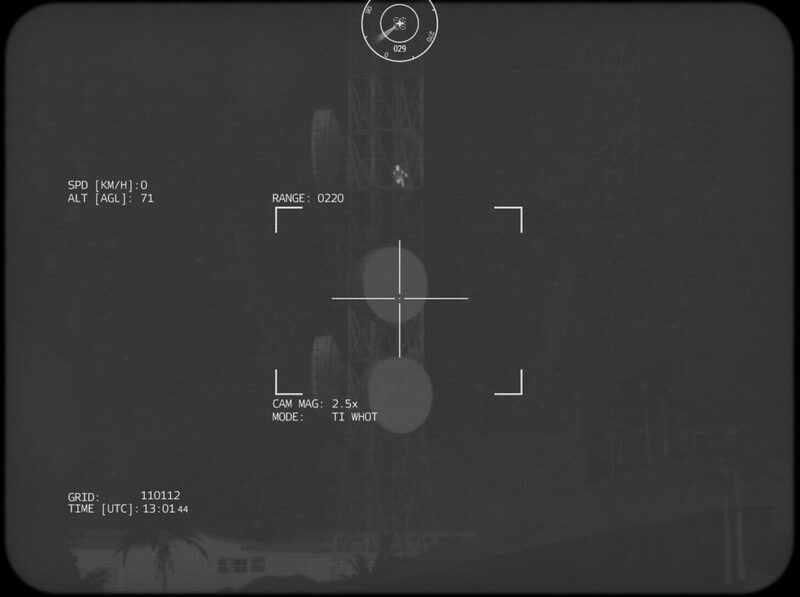 Laser designated by ground forces, the reflected laser light can be seen by the IR camera on the drone. The drone circles above awaiting the command to strike. 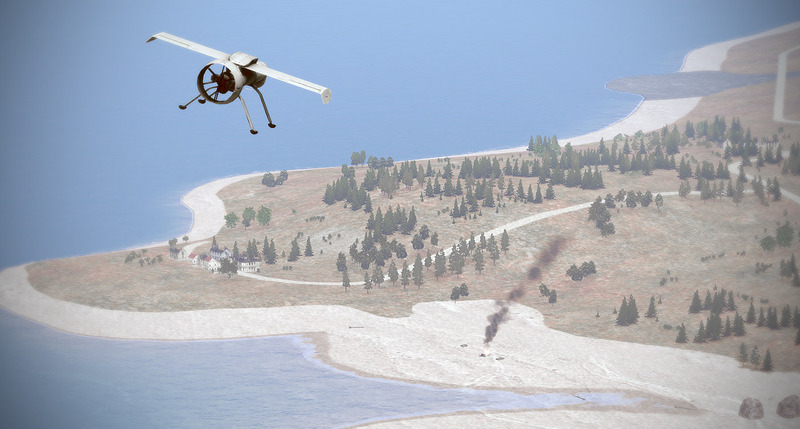 I’ve not had the greatest luck with fixed wing aircraft in A3 – I usually make it to the target area, struggle to get a laser lock, and then promptly get shot down – which is why I prefer helicopters over the fast jets. 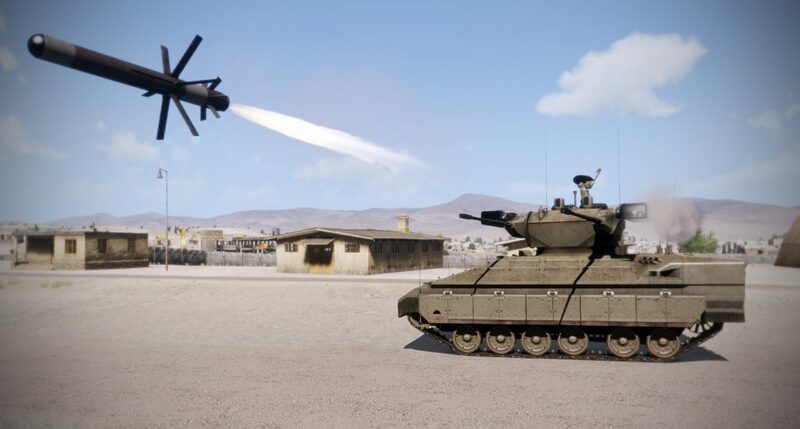 As if drones lasing for drones, drones lasing for aircraft, or drones lasing for helicopters wasn’t enough – you can also pair up with some nifty artillery to further disassemble enemy positions. Again, I’m not an expert on these things, but spending time in the Eden editor messing around with the units was great fun and very educational. 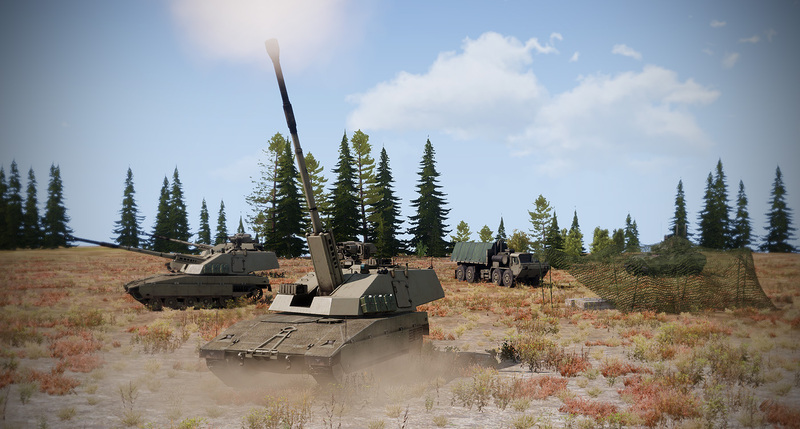 An interesting twist on artillery use in A3 is the ability of some artillery units to fire “smart” shells that can hit with extreme precision (sometimes). It can be hit or miss – literally. 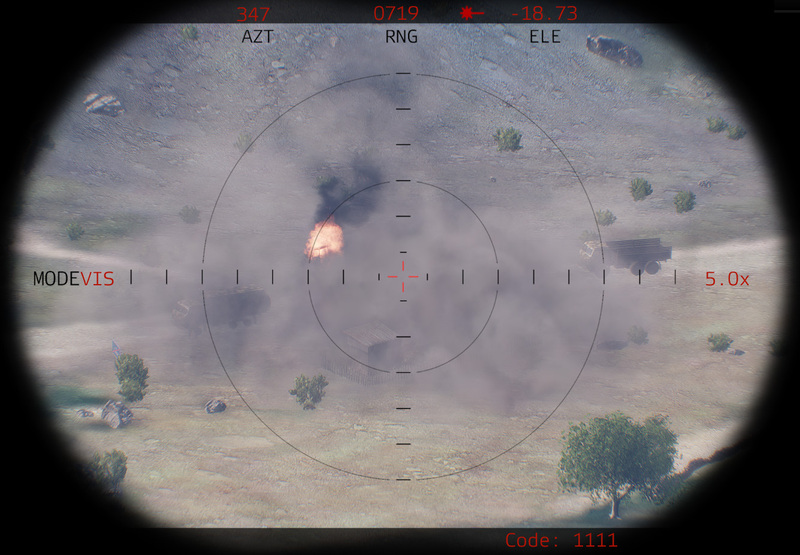 To test it out, I set up a couple missions where I was able to designate using a drone, then used an M4 Scorcher (self-propelled 155mm artillery) with laser guided shells to make attacks. The process is really fun, although my results were sporadic. There seems to be a small window of correct lasing time that does affect the accuracy of the rounds. On one mission, I was able to refine it to starting to lase at twelve seconds prior to impact and the results were 100% accuracy. 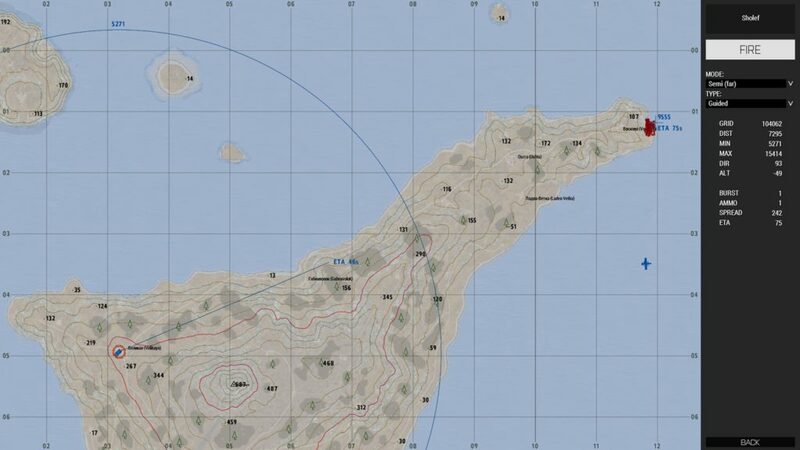 Shell flight times across the map can be enormous (75 seconds in some of my scenarios) and the included Artillery Computer makes all of that simple. 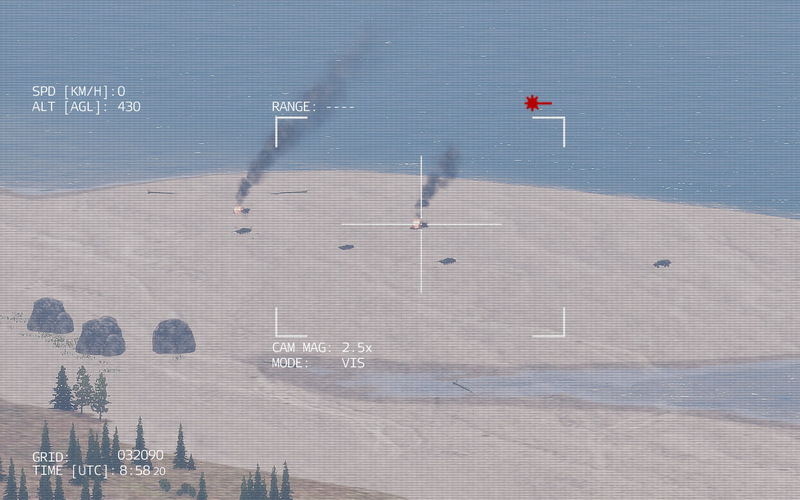 Watching the shells move across the Artillery Computer screen is pretty nifty. Laser designating can (sometimes) result in precise hits, but honestly, it’s just as easy to get your UAV close enough to locate the position of the enemy, then lay down some intense 155mm HE all over their area. Sure, if the target is sitting between the baby milk factory and the hospital, you might want to find a more surgical option. Keep in mind that some drones only require a short stretch of pavement to get airborne, allowing them to be deployed from roads, fields, or anywhere flat. Here my drone circles safely south of the target area, revealing most of the enemy positions on the map. 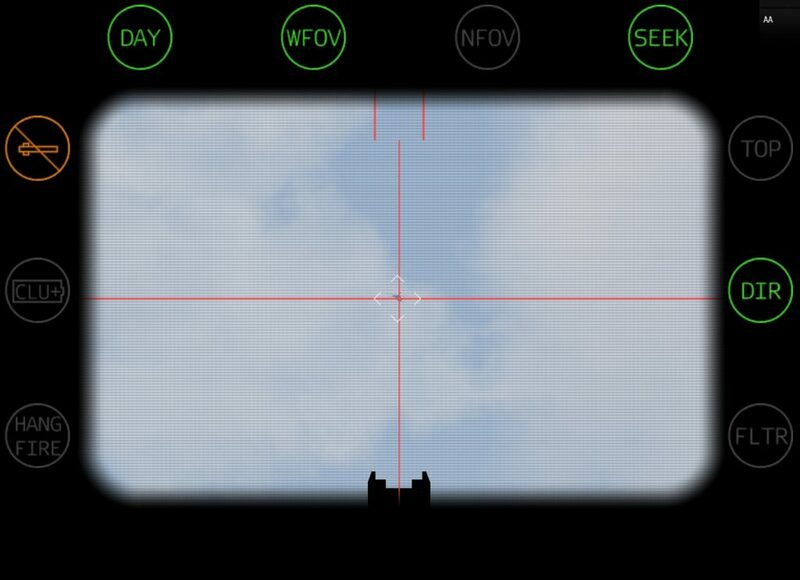 An up close view of the target area using the Artillery Computer. I’ve chosen Laser Guided, placed the crosshair near where the UAV is designating, and can anticipate a shell time of flight 75 seconds. 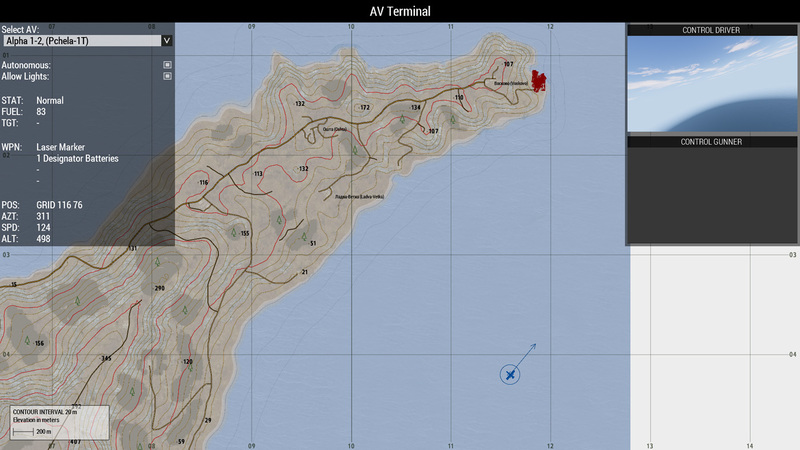 Tracking the progress of the shell as it travels across the Artillery Computer map. At about ten seconds prior to estimated impact – laser on to give the final guidance – then BOOM! 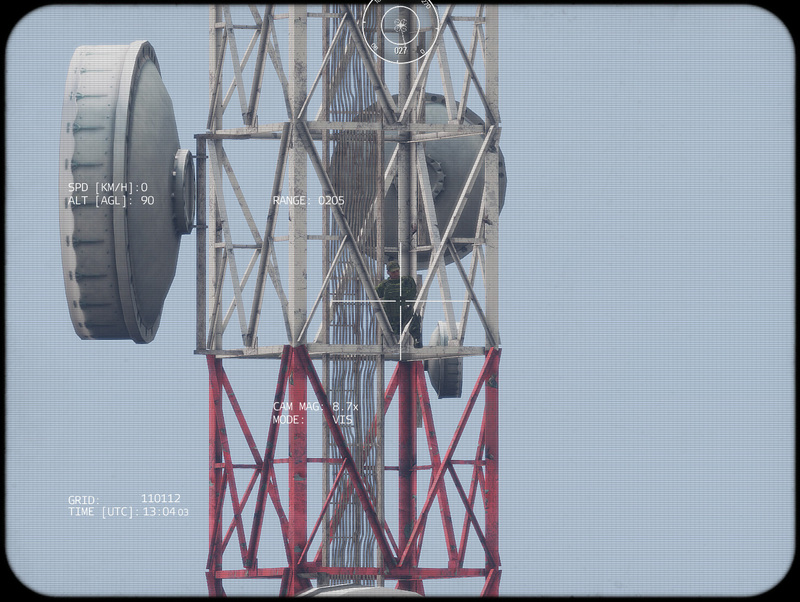 I was able to use the ACE menu to rearm and refuel drones… …but a repair specialist was required to fix them. 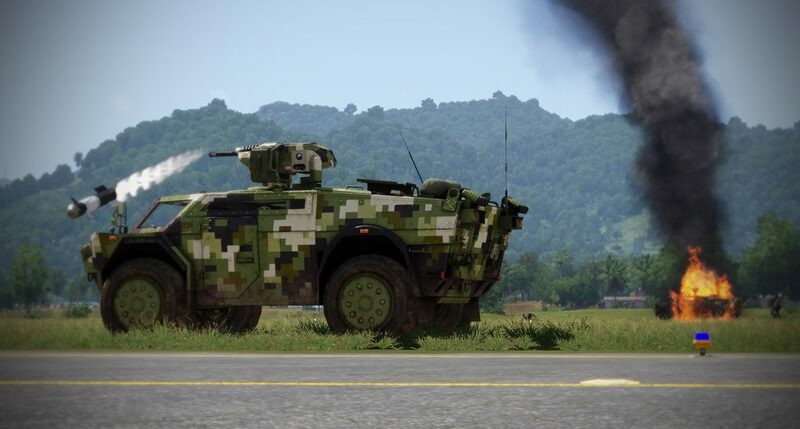 For an infantry-centric game/sim, there is no doubt that A3 offers a heck of a lot of content around the fringes that can become the primary gameplay for some users. There are some people that play A3 and only ferry troops in helicopters, or operate drones or fixed wing aircraft for support. Finding your niche and becoming good at it is a nice facet of the game. 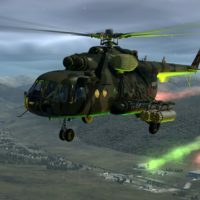 Unfortunately for me, I’m a bit of “jack of all trades, master of none” in my A3 gameplay, although I probably spend most of my time flying helos. The wide open community participation and ingenuity keeps fans of A3 in a near constant state of amazement. 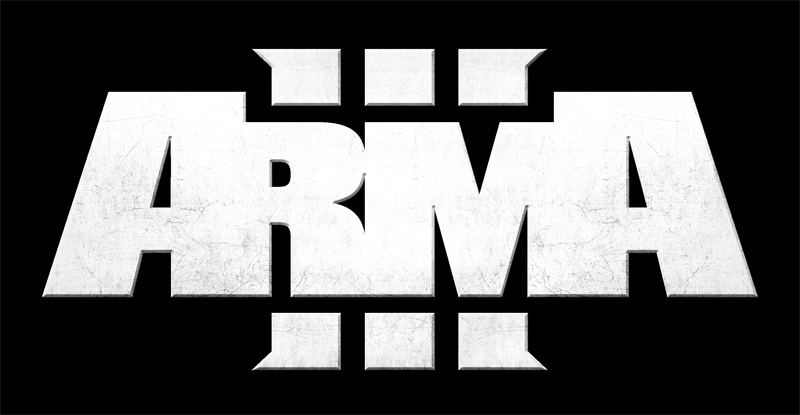 Each week there is a new mod, improvements to gameplay, new units, skins, weapons, and missions. As with anything so complex, there will be bugs, and the array of community add ons can be frustratingly complex – it often feels like my A3 install is a house of cards. New discoveries such as learning about the fun of utilizing drones are why A3 keeps me coming back over and over. SPARKLE! Nice pictures! I honestly didn’t really have the time to read everything, yet- but I spotted a mistypo. You wrote somewhere “knowing wear to look” (CTRL + F it you’ll find it fast). I imagine you wanted to write “knowing ewww to look”. Thank you for the quick spot…! Corrected. That’s what happens when my fingers go faster than my brain. Just joking but I did learn a lot thanks to your article, I had no idea the drone gameplay had been so fleshed out. A very interesting read! 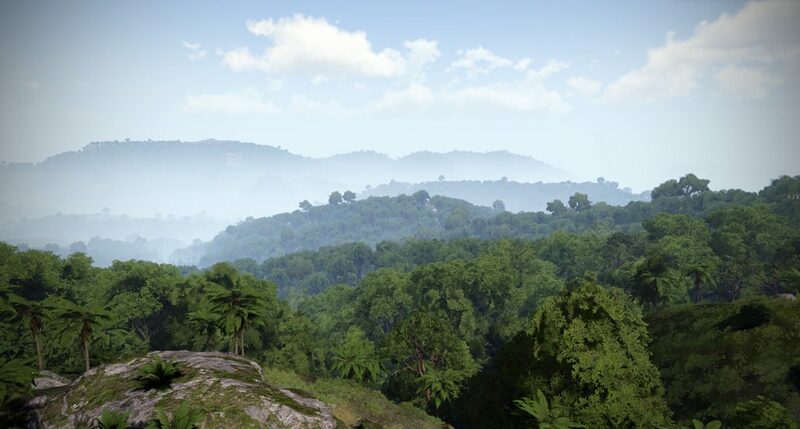 I’m still working my way through Operation Flashpoint so I’m afraid I cannot say anything about the ARMA3 features…really. Being a former intelligence officer who has spent a bit of time tasking, working with and using the “take” from Pred and Global Hawk, I found your comments about reconnaissance UAV’s accurate. 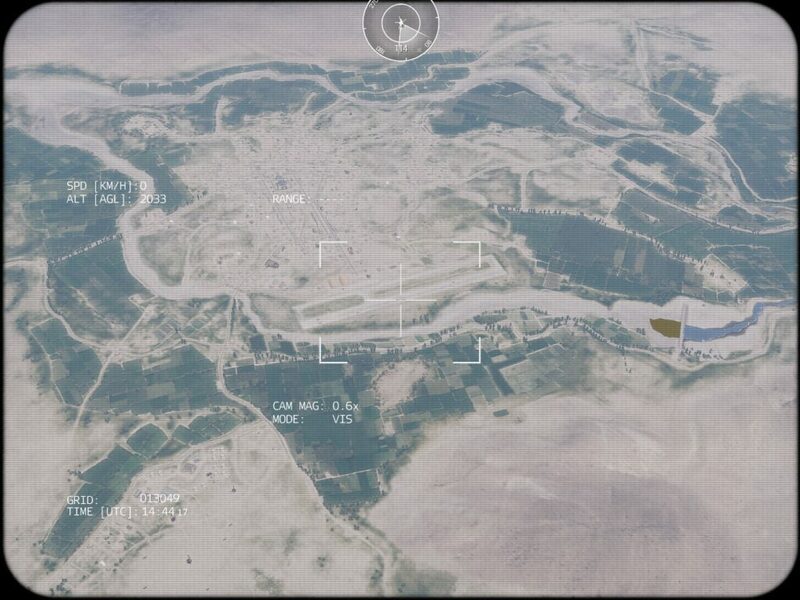 In the section entitled , “Location, Location, Location” you captured a major strength of a recce UAV like Pred. Hang around, out of sight and earshot, and just focus on a target. In the real world the “Hang around” time–“dwell time” is normally measured in hours…lots and lots of hours…before you see something of interest…and many times you see nothing at all. Hopefully the action in ARMA3 is a bit more exciting. I loved working with GH when I was in Japan for Operation TOMODACHI in 2011–the US military’s Joint Task Force mission to support Japan’s efforts at dealing with the devastating earthquake, tsunami and nuclear disaster. The thing has unbelievable dwell time and provided great imagery that was unclassified, meaning we could share it with everybody working the problem. Among many other things, we used it for “The Great Boat Hunt” (looking for fishing boats that had been carried far inland by the tsunami - the idea, salvage as many as possible to get the fishing fleet going again) and regular shots of the “damaged” (more like totally destroyed) reactors. (For NavyNuc99 - the things use a one loop system and when those pipes got knocked loose by the H2 explosions…you do the math). But I digress - a great feature article that I recommend we all bookmark for the future. I’m betting a lot of BeachAV8R’s comments and observations will become reality. …lots and lots of hours…before you see something of interest…and many times you see nothing at all. 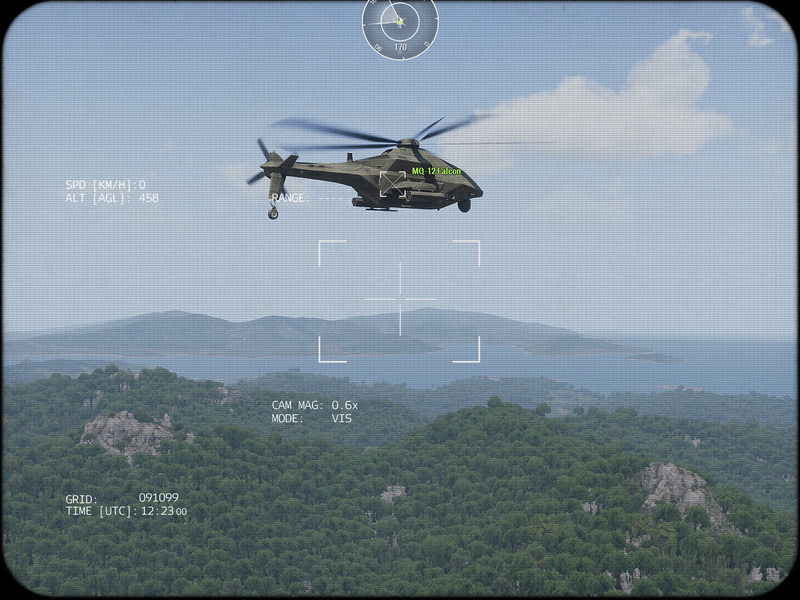 Hopefully the action in ARMA3 is a bit more exciting. 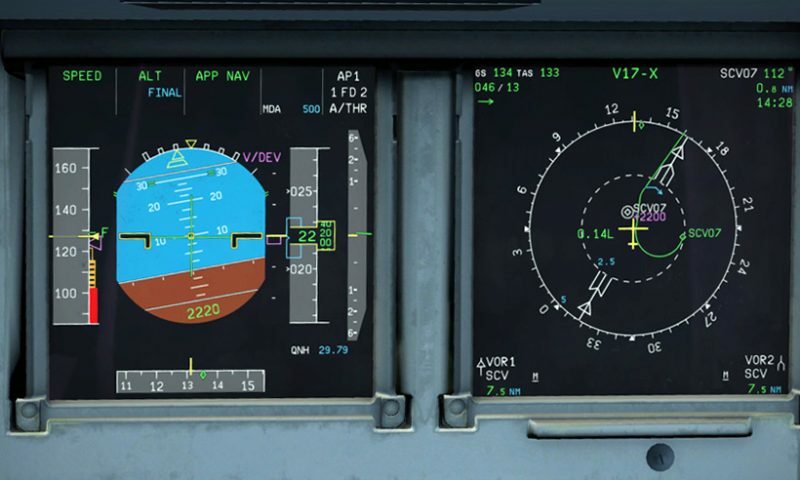 Yes - thankfully most of our sims compress action into playable time-frames Otherwise, yes, we’d all be endlessly circling the skies just waiting for a target of opportunity to pop up. Everything a GH does once the engine is started all the UAV. Takeoff–mission–landing…all hands off. Among many other things, we used it for “The Great Boat Hunt” (looking for fishing boats that had been carried far inland by the tsunami - the idea, salvage as many as possible to get the fishing fleet going again) and regular shots of the “damaged” (more like totally destroyed) reactors. Wow - that is really interesting that they were used in that unique way. Thanks again for the comments and observations…!